The dangers of dating a separated man are significant. Here are some dire situations to watch for when dating a man who is still married that so many women somehow overlook. My intuition is telling me to walk away from my current romantic situation but there are other factors involved and I don’t want to make a mistake. I bumped into an old flame in June and he asked me out on a date. He is currently separated from his wife and has been for almost two years. We are both in our 50s. I went out on three dates with him before he told me that he’d told his wife about us. Within a week, he informed me that she was texting him constantly and putting him under a lot of pressure and he was feeling guilty. On our 4th and 5th date he suddenly went very cold on me. The last date was an absolute nightmare. He then informed me he was going to see his wife to ‘sort things out and move on one way or the other’ and he hoped I understood! I was fine with that but, heard nothing for a few days. I was a little anxious when he eventually texted me. He said things were really bad between then and then had loads to sort out. I said I wasn’t happy with how things were going between us and suggested I give him some space which he agreed to. He said he would text me when ‘his head was sorted’. That was over a month ago. I’ve had a few texts since but, nothing to indicate that we are getting back together. Did I Push Him Away? I bumped into him recently – he was a little drunk and all over me. I admit to pushing him to make a few dates along the way but, have never texted or called him first. I’ve not always been available to meet him which he did not like. I’m not sure if I’ve pushed him away or if it’s really his circumstances that are keeping away. I have pushed guys away in the past and have tried very hard this time to be more aware of my actions. Should I walk away or wait a while before moving onto someone else. I guess this is one of the dangers of dating a separated man. I’d appreciate your advice. First off, this situation is EXACTLY why I warn women about the dangers of dating a separated man. And why I encourage you to avoid men who have not been divorced for at least a year. (Same thing goes for women too.) Before you enter the next dating situation, be sure to ask the man how long he’s been divorced. If it’s less than 9 months to a year, walk away! Any of these are reasons are enough not to see him again! What is it about him that makes him worth compromising your sense of self-worth and your time or affection? When certain parts of a man capture your attention and cause you to overlook unattractive characteristics, that’s how you KNOW you are compartmentalizing. What does that mean? In your mind, you separate the things you like about this man from the things you don’t like which you then ignore. These traits are all PART OF THE SAME MAN. You cannot separate them! He is a package deal and you need to see him as a whole – the good and the bad. When you do, my bet is you’ll decide to move on quickly. No matter how cute, fun, intelligent, rich this man is, he is also emotionally unavailable, attached to his wife, and well…rude. When this man said to you he had to “sort things out,” that was ManSpeak for “I can’t see you any more”. You hung around wondering how long it would take. He said he hoped you would understand, but you missed his meaning. He was exiting the relationship. Next time a man says he ‘s got to sort stuff out, say GOODBYE because that’s exactly what he means. You said that perhaps you pushed him away by not being available when he wanted to see you. But you are allowed to be busy. On the other hand, you mentioned that you’ve pushed other men away and that’s worth looking at. I encourage my clients to make themselves available when a man asks you out. I don’t mean cancel plans but, be sure to keep some open space in your calendar. If you can’t make a date, always suggest another time. In this case, it doesn’t sound at all like you pushed him away. I can’t help but think he used you to make his wife jealous, one of the dangers of dating a separated man. Otherwise, why would he ever tell her about you? There’s only one reason – and that is JEALOUSY. I think he was hoping to get her back by dating you which is sort of a crummy thing to do all the way around. Given everything I’ve explained in this post, I hope you see the wisdom and only real choice – move on to find a new man. You deserve better than dating a separated man and this kind of dysfunctional situation. I hope you meet men who are divorced for more than a year and healed of the trauma. Consciously choose to date guys who are ready to date, are emotionally available, and seeking a serious relationship. The men you date should not text or talk on the phone during your date and show you far more respect and interest. Know you are worthy of a man’s full attention unless there is an emergency. Want more insightful dating advice about not dating a separated man, not chasing men, and valuing yourself more? Download my free book 7 Dire Dating Mistakes Women Make that Keep You Single and get my newsletter too. Dating Over 40: I Want Him Back! Three Day Rule: Should I Have Answered His Text? Of course- its exactly the same I agree – but my audience is women so I don’t always bother saying the obvious. 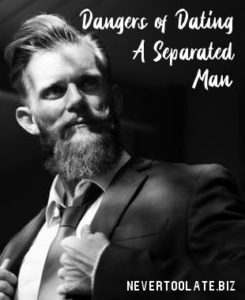 Dating a separated man is no worse than dating a separated woman. Any sincere dating coach would have pointed that out. This coach didn’t, so I did! Hi Barbara, You already left this guy once? What could possibly make you go back? He doesn’t cherish or treat you well and you know he’s your back up. So what is there to go back to? Take care of yourself, build your self-esteem, keep your dignity and cut off all communication with this man. He offers you nothing but heartache. I was with my boyfriend for 9 years and left him October due to verbal and financial abuse. He started calling to say he loves me and wants me to come home. I considered it, but found out he was also messaging his ex wife on facebook. Today I saw a message from her to him on the news thread she only wants to be friends for now. I feel in my gut that he is trying to hold on to me so I will come back and provide the financial support due to his being on disability and me working. I get the feeling that I’m his back up plan and his ex is his first choice. He’s been threatened me for 9 years that she’d take him back. Should I just work through the process of getting over him and stop the calls? Should I go back to him? Hi Pearl, Thanks for sharing your story. I had to shorten it a bit for the blog, but I’m so sorry things didn’t work out. I completely agree with you and I always advise women not to date a man who hasn’t been divorced for at least a year. I wish you all the best and lots of love. Just wanted to speak as a spouse who is trying to save her marriage. My husband and I separated and I did not want a divorce or separation. Our situation was extremely complicated, but I still had hope that we could work things out if things cooled down and we had time to process and eventually get to marriage counseling. 6 months after he moved out, he called me and told me he was going to start dating. I knew this meant that he had already found someone. I was devastated. He called and told me he had thought about coming back, but decided he didn’t trust that things wouldn’t get bad again. I could tell he was still on the fence about what he wanted to do. He told me many women had asked him out and I was dumbfounded. He was newly separated and people were trying to get in a relationship with him? For those of you thinking of dating a “separated” person, you don’t know the other side of the story. There may be a spouse who still wants to save the marriage. Inserting yourself into that situation could make it so that that family is not reunited. Wait until the divorce is over. If the person has a kid, I can tell you they will blame you for the fact their parents didn’t get back together. Hi LJ, I’m going to be straight with you – this is the classic separated man scenario. ( Married, cheating man scenario too.) Why are you so heavily invested in a man who is not truly available? This is all you’ll get for YEARS because he is not divorced. But he sure has you on the hook. Don’t believe for one second that his wife is not in the house on his weekend. This is the reason I say love is NOT enough because your love for him cannot make him leave his wife. A separated man is NOT divorced so he is not truly free. I’m not being moralistic – this is pure FACT. The BEST thing you can do is break up and move on. Start dating others. If he really has strong feelings and intentions to be with you, that might motivate him. But DO NOT count on it. He’ll likely go find another woman who will put up with his bullsh*t.
I have been dating a separated man for nine months. I have met his parents, I haven’t met his kids yet. He stays at alternate weeks with his parents and the next week with his kids in his house (supposedly the ex does not stay with him). We spend most of the time together on his free time, does not get calls from the ex ( I haven’t noticed). He says he is ready to move on (his ex was unfaithful to him). I am getting tired of waiting and waiting for the separation…. need some insight. Hi Dana, Run is right! Men who are separated are NOT divorced. So he is not free for the kind of relationship you want. He already passed you over once so why open yourself up to further hurt from this guy? Much smarter to start fresh with someone new. Hello, I recently began speaking to an old flame of mine who married his wife over me due to them already having a child together. The experience crushed me and it took me a while to get over him.. Now, they are separated and he contacted me. We’ve seen each other once so far but he always wants go out, but there is no divorce in process or anything. He tells me “we can be there for one another during the process”. Smh!!! My gut is telling me to run. I know this is hard for you but no you didn’t drive him back to her, he never left her. He’s a liar and a cheat and he keeps reaching out because he wants you both. Of course he wasn’t healed – it takes at least a year AFTER divorce to be healed enough for anything but casual dating. So while you tried to make sure he was ready, there’s nothing you can do about it except – avoid men who haven’t been divorced for one year. Ignore him and block him on your phone if you really want to be done with him and move on. That’s the healthiest thing you can do for yourself. I have been dating a guy for 9 months. He and I are both married however I will soon be divorced in January. He told me was also getting divorced. During our relationship I always felt like he was never fully healed. He always said “I don’t want her” or “You must want me to go back”. He was at my house everyday as if he were living with me. After 9 months, he says “until we are fully divorced we can’t be together”. Cut me off for a week then reaches back out. I snooped around in his phone and found out he’s trying to reconcile with her…lol which I kept asking him if was he completely over her. I confronted him with the info I found out and he denied then admitted it. So now I don’t call nor text him but he still tries to reach out asking for my friendship. My question to u what does he really want? Why doesn’t he leave me alone? Why does he keep reaching out? Was it me that drove him back to her? Hi May, How can you think he is a good husband when he has you? He is such a liar. I can tell this is hard for you but he is not being fair to you or his wife. He has no intention of getting a divorced – he wants you both. You deserve better than this man. Build your self-esteem so you don’t put up with this kind of situation and leave him asap. There are better men. Set your standards higher and avoid married men – if they aren’t divorced, then they are STILL married. I’m dating my partner for 4 months and living with my partner time to time as we live in different countries. There is strong chemistry between us and we love each other. He is separated for 4 years but not divorce and he said he will divorce but don’t push him. He has 2 kids but he still went to cook for the kids and his wife too. I feel he still has emotional ties with her. He said he doesn’t love her and she knows he is dating with me. I’m so confused why he doesn’t want to divorce and wants to have a love triangle. He has two houses and we live in second house that his wife never sees. I can see he is a good guy and responsible guy, good husband and good father. He wants me to be together with him forever but how can that be if he doesn’t divorce? Should I give him time because I love him so much? I feel very insecure and I don’t want to be with other woman’s husband in case there are any legal actions. Hi Janice, I have to admit my expertise is the start of dating and relationship, not marriage. I don’t consider myself qualified to give marital advice. However, I’m not sure that a mid life crisis is a good excuse for your husband’s behavior. Even if he’ll never meet this woman or physically cheat on you, he is betraying you emotionally. If he can’t cut ties with this woman for you, that makes me wonder what he offers in this relationship. You may enjoy many benefits and find it worthwhile. People stay together for many reasons and that is a choice only you can make. I’ve been married more than 10 years. We had separated for about 3 months and then he moved back home. I had to go overseas and while I was gone, I caught him chatting with some girl from another country I suspect is just using him. I filed for a divorce and then the day before it was to be final he cancelled it. I wrote to the other woman telling her we are still married. She just posted passive aggressive comments trying to rub their “relationship” in my face. I know it is up to him to tell her to get lost but I don’t think he has. He will never meet this girl as she could never get a visa to where we live. I think he is having a midlife crisis and I don’t know whether to just end the marriage or stick around. Yes you are wasting your time. He has no plans to divorce – he wants you and his family and for five years that’s been working out great for him. Even though he says he’ll be getting a divorce and his wife agrees – he hasn’t even started – and he never will. It’s already been years so more time won’t help. He’s a liar and a cheater. I realize you are in a tough spot since he’s supporting you financially. So you might want to come up with another plan to cover expenses. If you want lasting love with an honest, available man, you’ll need to go find one because I”m so sorry to say this guy is not the one. Hi Ronnie. Hi guys – thanks for your experiences as I’m looking into myself and my relationship with a separated man. I have been with him for 5 years. We live in two separate countries but I visit him and he does the same. All these years I was told that he was working on his divorce but I found out that nothing had started. His wife lives with him and they have kids. They knew about me. This man really loves me as he really support me in every way pays bills, ensure that I am not in need of anything etc). I get frustrated and feel like giving up on him. I prefer a single man vs. a married man for years with no movement. At the same time I am willing to give him a little extra time to complete his divorce. I’m not sure if his wife or kids are the problem even though he said she agree to sign. Am I wasting my time or just need to be a bite more patient? Help!!!! Dear Separated Guy, – yes there are exceptions to every rule. I understand what you are saying. But I still hold that 99.9% of the time, people still have emotional processing to do until that divorce is final and several months behind them, even if love is out of the picture. It’s about time to heal from the pain and feeling whole again, not necessarily about still being in love. I hope you find the kind of warmth and love you want and deserve now that you are nearly free and feel ready to date again. While I agree with you in principle, all separations and divorces are different. Your premise is based on a man still being in love with his wife and/or vice versa. That is not always the situation. In my case, my marriage had been over for a long time when I moved out. She had been asking for a divorce at least once a month for well over a decade. We had not had intimate contact for a decade. I held my loveless marriage together and kept it closed for my children. Being in an intimacy-free marriage is the worst kind of loneliness that a human being can endure. I can assure you that I was over my marriage for years before I put an end to it. I still have a few months to go before I meet the twelve-month residential separation requirement for no-fault divorce in my state. I have absolutely no desire whatsoever to return my soon-to-be ex, and she has absolutely no desire for me to return. All financial accounts have been settled. We are completely severed at this point. The holdup is the state. I”m so sorry this has happened to you. Sounds like there was no way to see this coming. My only comment goes back to the original post I wrote – a separated man is not a divorced man. Nor has he healed from the loss of love. My bet is you won’t ever date another man who hasn’t completed his divorce. I recommend not dating men who haven’t been divorced for at least a year. Experts agree it takes at least a year to heal and be ready for new love. But after you take time to recover, I’m sure you’ll find love again. You are in a tough situation. Unfortunately you don’t have any commitment from him and he could go back to his wife. At least he’s helping to support you and spending time with your children. I wish I knew what to tell you. Wow this has all been so insightful. I’ve dated a separated man for 12 months during his divorce. She left him after an unhappy marriage for many years. Our first six months of relationship was intense and we spent a lot of time together. We were happy and in love. Dear Michael, I’m so sorry to hear about your troubles with your hopefully soon to be ex wife. Your situation does sound awful. Given how devastated you seem, I recommend seeking out counseling – a good therapist can give you coping strategies. Getting through the divorce will help too. It’s time to focus on the next phase of your life which means starting the healing process. Recovery may take time, but that doesn’t mean you can’t recover. Prayer can also be a huge help. There may also be divorce support groups where you can share with others goingg through the same thing. I send you compassion and healing thoughts. My wife left me 6 months ago, with no explanation. I found out she was living with a married man from his wife! I’ve been searching for answers, to get into her good grace enough to find out what are her intentions. I have to pay all the bills, she pulled her financial “half” when she left, and doesn’t make payments on co-signed loans. This woman I have loved dearly for years and its been a continuing nightmare and I need to somehow stop loving her entirely. Easier said than done. About dating a separated man. I’m bewildered by some of the common scenarios here. I have read statistics that most relationships born in deceit end quickly due to trust issues. My trust is wounded but my integrity is intact. Now I’m a separated man, and in this horrendous situation. I am so perplexed with how dishonest some people can be and how lonely the righteous person can be. Good for you! And thanks for encouraging other women to avoid separated men. You are so right Ronnie! I “dated” a man who was 45 (I’m 32) and he was separated. He assured me he was only married on paper and he did not love his about to be ex wife. Well turns out down the line he had told his family that he would not date openly until the divorce, which was being dragged out by division of assets! It could be years before its finalized. It was a horrible situation. Girls you can do better, being alone is better. They will do nothing but drag you down. Run! Congratulations on having boundaries and putting yourself first. Excellent! You will be an inspiration to other women for sure. I came back to my old flame 4 years ago. As soon as I knew he was married I stopped communicating. But after one year he moved form one country to another one and invited me to meet. I could not go but also he become ill. Then for 3 years we exchanged emails and texts. Until a month ago I went to see him. We were very happy to meet and kissed. He has been separated but not divorced so when we had the evening together his wife surprised him and he left after few hours. I was upset but at the same time it was better because I realized that I could not invest my heart into someone who is not free. It was not right for her, for him, but even more for me! So I wrote a goodbye mail stipulating that it was not appropriate for me to initiating more contact. No matter what reason I must come first and put healthy boundaries. For me it is a total responsibility to step out and stand up for my truth. I must value the woman I am first and foremost! I am not the second best choice to anyone and although it hurts me a little, it could have been worse months ahead. Wisdom is always the best option!!! I have deleted and blocked his number so I can move on and I will find love because I love the woman I am. Good luck to all women in this situation. Be the one for yourself! Hi Anais, Yes you tell a sad story. I’m glad to hear your strong resolve of never again. Good for you. It’s pointless to date a man who is still in love with another woman. You are right about not having his love. I’m sorry you were heartbroken – its a tough lesson. But now you are wiser and know better. There’s a good man out there for you so don’t give up! I wish I had followed your advice months ago! I was in a relationship for almost a year and now feel like a teenage rather than a 40 something woman who should know better. He had been on and off with the wife until 3 months before we got together. I knew he was mourning his lost marriage but I fell for him quickly and ignored the signs. His ex texted him as if they were still together and constantly demanded his attention, particularly at Christmas when he chose not to go visit. He denied he still wanted to be with her, yet I could hear his sadness and knew he missed her. He said it was her choice to end the marriage. I felt him slipping away so I asked him to be honest. He never contacted me again and his silence told me I would never have his love. The hardest part is that I know he will already be dating someone new because he believes it isn’t normal to be single. It breaks my heart. Never again.